56 • FOODSERVICE EQUIPMENT & SUPPLIES • FEBRUARY 2019 ajita Pete's Founder Pedro Mora saw the trend toward guests eating away from restaurants com- ing a decade ago. Now established in one market, Fajita Pete's is building the infrastructure for suc- cessful expansion. Off-premise dining continues to revamp the restaurant industry in more than just a metaphorical sense — it's liter- ally reshaping physical restaurants. Established chains are building smaller locations, removing seats, adding additional production lines and building dedicated pickup areas for to-go orders and third-party deliveries. For Houston-based Fajita Pete's, though, this shift doesn't pose any operational challenges. Since the chain opened its first location in 2008, it has focused on off-prem- ise dining with to-go, delivery and catering offerings. 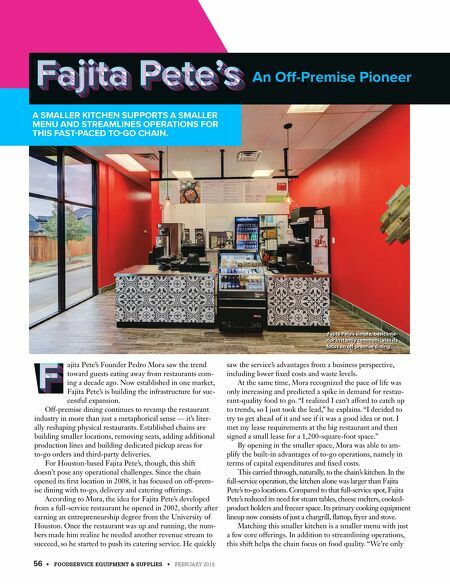 According to Mora, the idea for Fajita Pete's developed from a full-service restaurant he opened in 2002, shortly after earning an entrepreneurship degree from the University of Houston. Once the restaurant was up and running, the num- bers made him realize he needed another revenue stream to succeed, so he started to push its catering service. He quickly saw the service's advantages from a business perspective, including lower fixed costs and waste levels. At the same time, Mora recognized the pace of life was only increasing and predicted a spike in demand for restau- rant-quality food to go. "I realized I can't afford to catch up to trends, so I just took the lead," he explains. "I decided to try to get ahead of it and see if it was a good idea or not. I met my lease requirements at the big restaurant and then signed a small lease for a 1,200-square-foot space." By opening in the smaller space, Mora was able to am- plify the built-in advantages of to-go operations, namely in terms of capital expenditures and fixed costs. This carried through, naturally, to the chain's kitchen. In the full-service operation, the kitchen alone was larger than Fajita Pete's to-go locations. Compared to that full-service spot, Fajita Pete's reduced its need for steam tables, cheese melters, cooked- product holders and freezer space. 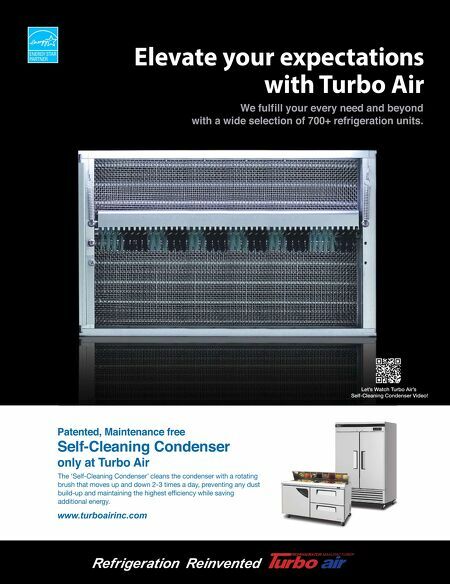 Its primary cooking equipment lineup now consists of just a chargrill, flattop, fryer and stove. Matching this smaller kitchen is a smaller menu with just a few core offerings. In addition to streamlining operations, this shift helps the chain focus on food quality. "We're only An Off-Premise Pioneer A SMALLER KITCHEN SUPPORTS A SMALLER MENU AND STREAMLINES OPERATIONS FOR THIS FAST-PACED TO-GO CHAIN. Fajita Pete's simple, basic inte- rior instantly communicates its focus on off-premise dining.